The SM-68 was a two-stage liqued-fueled rocket-powered missile. The first stage used two Aerojet LR87-AJ-1 engines, and the second stage consisted of a single Aerojet LR91-AJ-1, with all engines burning kerosene (RP-1) and liquid oxygen. The SM-68 used a radio-command/inertial guidance after the originally planned all-inertial system had been transferred to the SM-65/CGM-16 Atlas. The SM-68 used the same Mk.4 reentry vehicle and W-38 warhead as the SM-65E/F Atlas E/F. The missiles were stored in widely dispersed hardended underground silos. After fueling, the Titan I had to be lifted out of the silo for launch. As with the Atlas, the non-storable liquid fuels were a safety hazard and also lead to a reaction time from order to launch of about 20 minutes. There was also an unarmed training version of the Titan I, designated USM-68A Titan Trainer. The designation SM-68A was reserved for a projected derivative of the Titan I with structural modifications to allow launch from within the silo. This concept was abandoned in favour of the much more advanced SM-68B Titan II. However, seven Titan I missiles were built as XSM-68A test vehicles to test the new inertial guidance system of the forthcoming SM-68B. As early as 1959, Martin proposed a much improved version of the Titan to the USAF. It was to include an all-inertial guidance system and storable fuels, allowing almost instantaneous launch. While the solid-fueled SM-80/LGM-30 Minuteman then in development also offered these capabilities, the proposed improved Titan could lift a much heavier payload. Therefore in June 1960, Martin was awarded a contract to develop the SM-68B Titan II. The Titan II would also use a completely new silo, from which the missile could be launched directly. 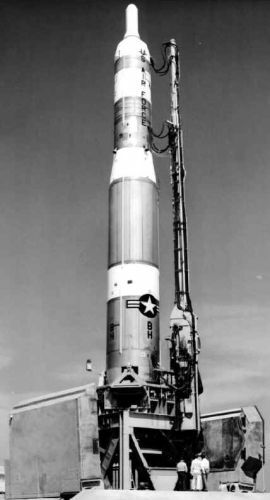 In March 1962 the first XSM-68B missile was flown, and the first silo-launch of a Titan II succeeded in April 1963. In the same month, the first Titan II was on combat alert. The SM-68B Titan II used the same basic two-stage design as the Titan I. However, the upper half of the SM-68B differed significantly from the SM-68, because the second stage was enlarged to the same diameter as the first stage, and a new Mk.6 reentry vehicle was used to house the massive 9 MT W-53 thermonuclear warhead. The improved engines burnt storable liquid fuels, a 50% mix of Hydrazine and UDMH (Unsymmetrical Dimethylhydrazine) as fuel and Nitrogen Tetroxide as oxidizer. Auxiliary solid rockets used in the Titan II included a Thiokol SR51-TC-1 retro-motor and a United Technology Center SR55-UT-1 staging motor. The Titan II was by far the most powerful nuclear armed missile ever deployed by the United States, with a deployment level of 54 LGM-25C missiles between 1964 and the beginning of its retirement in 1984. 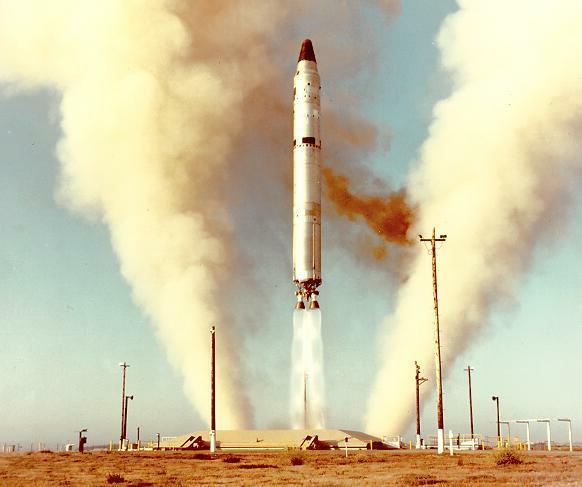 The Titan II remained in service so long despite the fielding of more than 1000 of the much easier to operate solid-fueled LGM-30 Minuteman, because the huge warheads of the few Titan IIs represented almost 30% of the overall ICBM "megatonage" of the USAF. The only major improvement fitted to the LGM-25C during its service life was the installation of the so-called Universal Space Guidance System, developed for the Titan III space launch vehicle. Retirement of the LGM-25C ICBM was completed in 1987. In total, about 135 Titan II missiles were built. The Titan II was a very reliable missile, and it was therefore used by NASA in the Gemini manned spaceflight program under the SLV-4 designator. Initially, the USAF did not use the Titan II as a space launch vehicle. The main USAF heavy lift space launcher was the SLV-5 Titan III, being developed as a Titan II with strap-on solid-fuel boosters and several types of additional upper stages. However, after retirement of the Titan II ICBMs in 1987, the remaining missiles were refurbished as launchers and designated SB-4A in 1990. Other designations assigned in 1990 to modern Titan launch vehicles are SB-5A/B Titan IV and SB-6A Titan 34D. The Titan was the standard USAF vehicle to launch heavy payloads into orbit until the last one was launched in October 2005. For details on Titan launch vehicles, see page on SLV-4/SLV-5/SB-4/SB-5/SB-6. The successors of Titan in the heavy launch vehicle role are the Atlas V and Delta IV EELVs (Evolved Expendable Launch Vehicles).